The YEStablet is available in a ruggedized version for industrial applications where additional protection is required. It is a wireless, portable, Thin Client, Windows Based Terminal with advanced features applicable to a wide variety of applications. 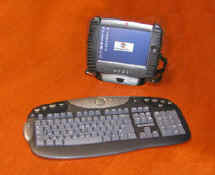 The device provides access to Web-enabled applications, Windows Terminal Services, Citrix Servers and IBM host computers via 5250 and 3270 terminal emulation. YEStablet features a bright 8.4 inch TFT�LCD screen with 800 by 600 resolution, touch screen support and pop-up keyboard in two sizes. Windows, Browser and IBM terminal emulation can be operated using the stylus provided and the popup, on-screen keyboard used only when data input is required. Addressing the need for a portable data collection terminal with a full 5250 emulation is easily accomplished. 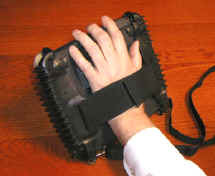 Simply attach your data collection device (laser scanner, wand, etc.) to the built-in USB port. No screen reformatting is required as with other wireless data collection solutions. Supporting the 802.11b protocol standard, the YEStablet allows you to access your IBM host (AS400 and/or S390), run Windows applications with standard RDP and ICA protocols, and access the Web with a local browser. 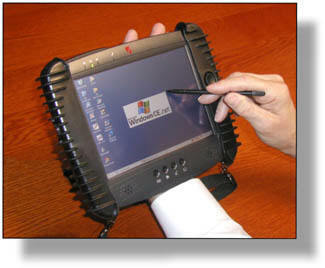 Unlike notebook computers with wireless cards that are heavy and cumbersome or Palm/Pocket PC devices that have limited screen size and no host emulators, the YEStablet provides the mobile functionality you require at a surprisingly affordable price. 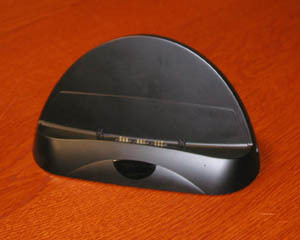 Support for Wireless Keyboards (IR) or standard USB attached keyboards while in the docking cradle at the desktop. 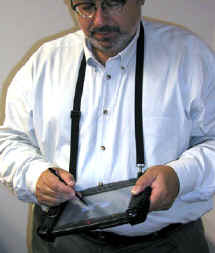 Integrated Hand Strap - allows easy one-handed holding of the YEStablet while using the touchscreen. Integrated Anchor Points at all four corners for attaching the included neckstrap. Makes carrying and using the YEStablet very convenient in job functions that require the user to be moving around such as in manufacturing, distribution or inventory environment. 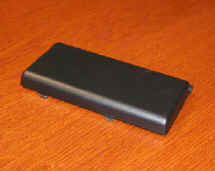 Optional External Clip-on Battery - allows additional wireless use. The external battery power is used first. If it runs down, you can remove it while still having power from the internal battery.